Preheat the oven to 200°C/400°F/gas mark 6 and line 2 baking trays with parchment paper. In a large mixing bowl, mix the flours, oats, bicarbonate of soda/baking soda, sugar and salt together. In another bowl, mix the vanilla extract and coconut oil together. Slowly mix the liquid mixture into the dry mixture, then slowly stir in the beaten eggs. Add the chocolate, and, using your hands, mix it in. Roll one dessert spoon of the cookie dough into a small ball and place on a baking tray. Repeat this step until you’ve used up all the mixture, making sure you leave quite a bit of space between each ball. Using the back of a fork, flatten each ball. Bake in the oven for 12–15 minutes, until golden brown. Then leave to cool (remember they cook more as they cool down). Established by James Duigan in London in 2007, Bodyism offers a total wellness solution including bespoke personal training, supplements, clothing and six best-selling books. 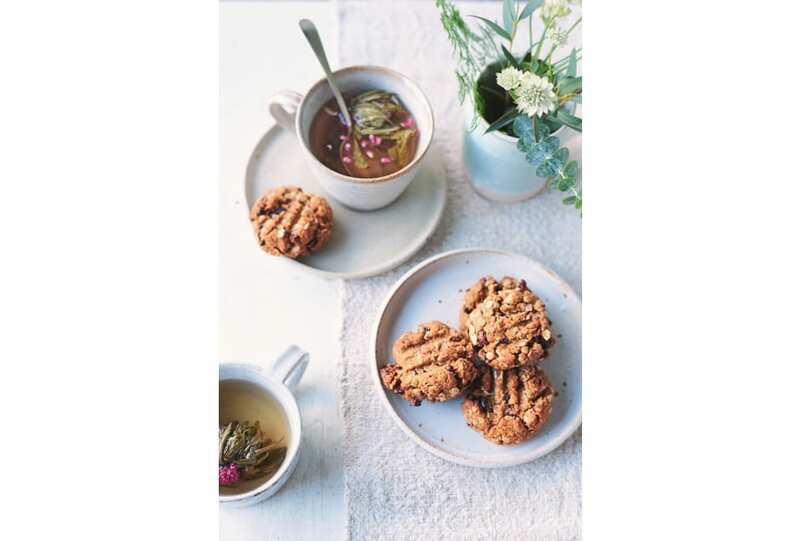 Recipe taken from the James Duigan’s Blueprint for Health.